Half-price dining - today only! 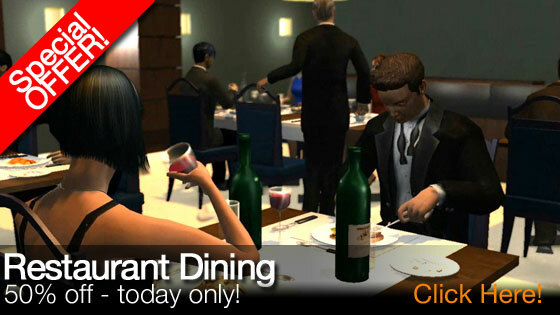 Special offer - today only - Get the Restaurant Dining pack for just 1000MSP instead of 2000MSP! Treat your characters to an elegant meal in one of our customisable contemporary restaurant interiors, featuring a full menu of food and drinks, and a range of animations for the perfect dining scene. It's just what you need for filming classic scenes from movies such as When Harry Met Sally, Reservoir Dogs, Goodfellas or just planning your wedding seating. Top up your Moviestorm Points here. Points start at $9.99 for 1000 points - and if you buy more points, you'll save more! Just posted this on my Facebook page as I do every sale you have and also left a very complimentary comment about Moviestorm. I have used all kinds of animation software and Moviestorm is the very best. For anyone who hasn't got this pack, the seated animations are extremely useful. You can always hide the posh table and dishes etc but still use the motions. Highly recommended. You are right Primaveranz. This is one of the best addons Moviestorm has made. Very useful in many ways and it works beautifully. This one is a must have.